As we've already said, Southern Pacific's Rule 93 grew ever more complex over the years. As evidence, compare the 1930 rule above, with its 1982 counterpart, below. In general, the same could be said for the entire SP rule book. Though similar in overall dimensions, minus covers the 1930 "Black Book" was 5/16" thick, while the 1982 "Blue Book" (which originally replaced the Black in 1976) was 5/8". To boot, notice that the print (reproduced here in proportion to one another) in the later epic was allot smaller. 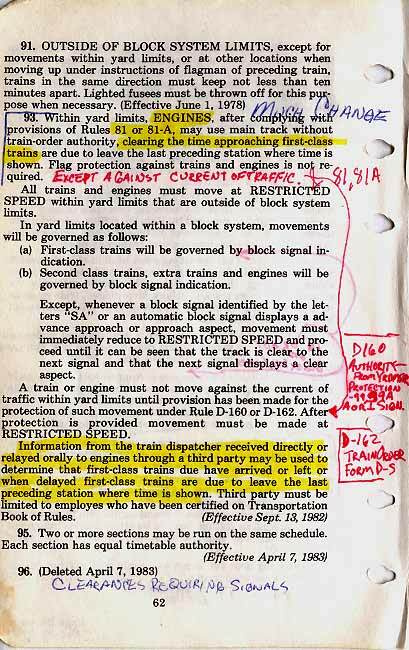 Today (2005), General Code operating rules are less complicated than 1980's SP's, but overall, things are even more complex, because most railroads have reams of outside-of-Code rules for better living, such as Amtrak's prohibition against walking down a corridor with your hands in your pockets (true!). Lawyers. To make you feel better about your struggles to comprehend train orders and such, we've reproduced the 1982 version with warts and all. This was E.O. 's 'working copy' (thus, worth a fortune on eBay) with nearly unfathomable annotations placed upon it during introductory firemen's training in late 1984 - this after six months of intense practical training as a trainman on SP's Carrizozo Sub earlier that year. As an academic exercise (read: waste of time) you might want to study the above to get a clear understanding of the rule as it stood during the mid (not early, late) 1980's. Alternately, you might take notice of the scrawl under Rule 96: as of April 7, 1983, Clearances no longer required an entry in the Display ___Signals line, because SP had eliminated the use of class lights (signals) on trains.